What do you get for the civil engineer on your list this gift-giving season? 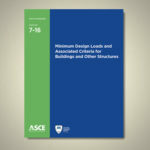 It’s a tough decision, but the ASCE Publishing Best-Sellers List is a good place to start. 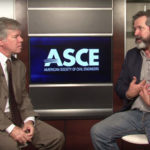 It was a major year in publishing at ASCE, topped by the release in the summer of the much-anticipated standard, ASCE 7-16. 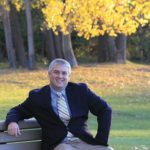 Starting, managing, and owning an engineering firm can be a daunting experience. 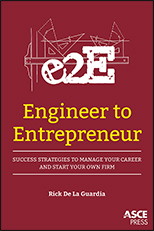 This book by Rick De La Guardia provides practical steps at key career points to reach professional goals in any engineering discipline. 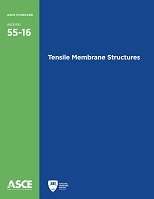 This standard provides the minimum criteria required for analysis, design, and performance of membrane-covered cable and rigid member structures. It was prepared by the Tensile Membrane Structures Standards Committee of the Structural Engineering Institute’s Codes and Standards Activities Division. 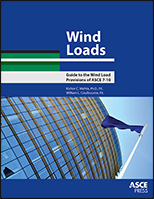 This guide, by Kishor C. Mehta and William L. Coulbourne, focuses on wind load provisions in Minimum Design Loads for Buildings and Other Structures, ASCE/SEI standard 7-10, affecting the planning, design, and construction of residential and commercial buildings. 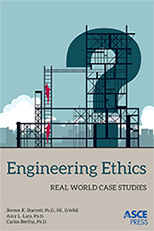 Organized by the canons of the ASCE Code of Ethics, this guide by Steven K. Starrett, Amy L. Lara, and Carlos Bertha, benefits civil engineers in all disciplines and career stages, including practitioners, consultants, government engineers, engineering educators, and students. 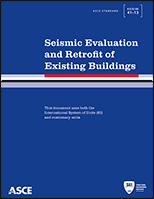 Using performance-based principles, this standard lays out deficiency-based and systematic procedures used to assess and retrofit existing buildings to better withstand the effects of earthquakes. 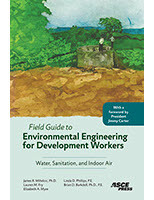 Fully illustrated, the guide is a complete handbook for international engineering service projects that involve water supply and treatment, watersheds, sanitation systems, and indoor air quality. Authors James R. Mihelcic, Lauren M. Fry, Elizabeth A. Myre, Linda D. Phillips, and Brian Barkdoll provide the tools necessary to implement the right technology in developing regions around the world. A foreword by President Jimmy Carter provides incentive. 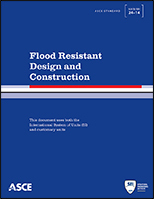 Prepared by the Flood Resistant Design and Construction Committee of the Codes and Standards Activities Division of ASCE’s Structural Engineering Institute, ASCE/SEI 24-14 provides minimum requirements for design and construction of structures located in flood hazard areas and subject to building code requirements. 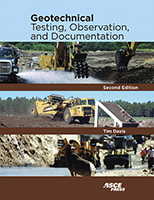 An in-depth field manual for soil technicians and geotechnical engineers, this reference guide by Tim Davis is organized for use during the investigation, grading, and construction phases of geotechnical projects. 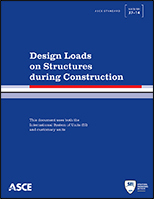 Prepared by the Design Loads on Structures during Construction Standards Committee of the Codes and Standards Activities Division of ASCE’s Structural Engineering Institute, ASCE/SEI 37-14, describes the minimum design requirements for construction loads, load combinations, and load factors affecting buildings and other structures that are under construction. 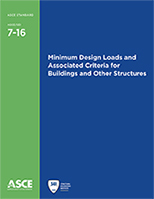 Prepared by the Committee on Minimum Design Loads for Buildings and Other Structures of the Codes and Standards Activities Division of ASCE’s Structural Engineering Institute, ASCE/SEI 7-16, provides the most up-to-date and coordinated loading standard for general structural design. 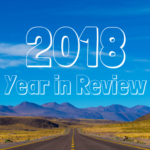 A comprehensive online edition of 7-16 and 7-10, featuring robust searching, redlining, annotation and sharing tools, will be available in early 2018 at asce7.online.